Monday we asked you "What's the iPhone 3G Chip and When Will it Ship?". Tuesday it was "What is the iPhone 3G Going to Look Like?". Today we want to know what YOU think the iPhone 2.0 software and services are going to give us, and what surprises might they have in store? Exchange ActiveSync and the AppStore are gimmes. Enterprise features are checked. Beta leaks are everywhere. And .Mac to Mobile Me -- Don't get us started! But what else will we get? MMS? Blogging? Mobile iChat? Universal home remote control? And what about the Holy Grail... cut and paste?! What do YOU think? To give you some help, here's a HUGE roundup of all the iPhone 2.0 software and services rumors. Epic-style. Because let's face it, roughly 0.01 seconds after Steve Jobs pulled the first iPhone from his pocket back at Macworld 2007, and someone, somewhere, put aside their childlike sense of wonder long enough think: "Nice! What's the next gen going to be like?" Five days from today Steve Jobs takes Moscone Center stage for the sold-out WWDC keynote, and according to everyone and their newsfeed, announces the iPhone 3G. In eager anticipation, every day this week, TiPb wil be asking you to tell us what you think the next generation iPhone will be, from 3G to GPS, release dates to price points, colors to casings, 2.0 software to .Mac .Me services, and this weekend we'll wrap it all up with a look into the WWDC/iPhone 3G Crystal Ball, and a roundup of the very best of YOUR predictions. The iPhone's interface quite literally took the smartphone world's breath away. Some of us watched the Macworld 2007 demo over and over again -- watched as Jobs slid, flicked, pinched, spread, and otherwise touched his way around a set of mobile applications so good looking they were positively "lickable". We got SMS, Calendar, Photos, Camera, YouTube(! ), Stocks, Maps, Weather, Clock, Calculator, Notes, Phone, Mail, Web/Safari, and iPod/Media Player, and Settings for all of them. The wait for release day was torturously long. Apple also showed an unprecedented ability to upgrade and add functionality via firmware updates handled by iTunes. Minor things included double-clicking the home button to bring up Phone Favorites or the Currently Playing controls on iTunes, and double spacing to add periods. On the major side, the iTunes WiFi Music Store made its debut in the fall alongside the introduction of the iPod Touch, CoreLocation made Google Maps so much more useful, and WebClips and "jigglies" allowed for custom SpringBoards (home screens). All in all, we got updated 1.1.1, 1.1.2, 1.1.3, and 1.1.4. And then came the Apple SDK Roadmap Event and the debut of 2.0 (Beta). March 6, 2008: Apple held their iPhone SDK Roadmap Event. While this event was primarily focused on the SDK and 3rd party apps (which we'll get to tomorrow! ), it also unveiled firmware 1.2.0 (which soon after became 2.0). What did that mean for 1st party iPhone software and services? Phil Schiller, VP of Marketing announced Cisco IPsec VPN, authentication and certs, enterprise/University compatible WiFi (802.1x), security policies, enterprise configuration tools, and "remote wipe". But none of that was the big news. The big news was that Apple had licensed Microsoft's Exchange ActiveSync technology. Not any locked-in application, but the technology itself. And they were going to be integrating it into MobileMail, Mobile iCal, and the other built-in iPhone apps for "push" based enterprise support. What's more, ActiveSync was given first-class status, even over Apple's own .Mac and existing partners Yahoo! and Google. [T]he beta iPhone 2.0 software provides several new Mail features such as the ability to view PowerPoint attachments, in addition to Word and Excel, as well as the ability to mass delete and move email messages. Eagle-eyed viewers, like our own Chad Garrett, also spotted icons that provided the first hints of Event Invitations and Contact Search. March 17, 2008: Hax0rs extraordinaire, the unofficial iPhoneDevTeam found the Parental Controls settings when they managed to get their hands on a pre-release of the 2.0 software. March 18, 2008: Apple released Safari 3.1 with built-in support for advanced CSS, including animation, and HTML 5.0, including video and audio tags, as well as key technologies for offline interactivity, including SQLite databases. Based on the same WebKit framework, and big brother to the MobileSafari browser, could the same feature set be making its way to the iPhone? March 25, 2008: Though his predictions about the first generation iPhone proved completely wrong, on his monstrously popular Diggnation podcast Kevin Rose claimed that iPhone 2.0 would include iChat video conferencing. Likewise one of the longest and most confusing debacles of the first generation came to a head with rumors that politics and positioning would make 1st party Flash support in the iPhone unlikely even for 2.0. March 27, 2008: iPhone SDK Beta 2 is released by Apple, changing the release numbers from 1.2.0 to 2.0, superficially with a YouTube plugin for Safari, and VPN, mail, and ActiveSync tweaks and re-org’s. Over at Apple Insider, a very interesting Apple DVR patent was uncovered. More than just a TiVo-style device, it suggested the iPhone could work as a remote manager, scheduling recordings while you're out, and syncing them so you could take them with you on the go. Was Apple poised to free your TV, with the iPhone as its key? Syncing with this Dot Mac account will turn off syncing for other Dot Mac accounts and delete any existing synced data. March 30, 2008: Not tiring of the seemingly endless soap opera, Gizmodo brought word (again), that Flash would be coming to the iPhone with firmware 2.0. Unfortunately, they mistook embedded YouTube support in MobileSafari for Flash. More likely, it's a mere extension of existing MP4 H.264 video support already found in the YouTube App proper. April 8, 2008: Engadget leafed through their WWDC course program and found hints at a MobileSafari update bringing CSS transformations and animations. Could it be getting the same ultra-modern love desktop Safari 3.1 got? April 9, 2008: iPhone SDK Beta 3 was dropped, with the before-rumored Contact Search and Event Invitations activated. April 14, 2008: More from Beta 3, as Gizmodo's anonymous tipster discovered the ability to save images directly from MobileSafari to the iPhone Photo Album. Meanwhile, Roughly Drafted speculated that ActiveSync itself could be a trojan horse for more open, standards-based "push" protocols like IMAP IDLE and CalDAV. Could Apple get a gorgeous iPhone interface in front of users, while they worked behind the scenes on technologies already supported in Leopard Server as part of the .Mac revitalization for consumers? April 17, 2008: Apple Insider shone the light on an Apple patent for an iTunes-like iCarrier store for selecting carriers based on up-to-second rate information. This would remove lock-ins to the extent where the big telcos would "bid" for users by offering the best price/performance deal in real time. Unlikely any time soon, given the existing carrier agreements already in place, but one day? April 22, 2008: Ever watchful Apple Insider revealed a patent filing that held tantalizing potential for a Mobile iChat, and also much-improved MMS and SMS applications. Multi-tasking 3rd party app restrictions may one day have a 1st party solution? April 24, 2008: iPhone 2.0 SDK Beta 4 hits, with mucho developer tool fixes, updates, and enhanced functionality. April 27, 2008: Deep code diving on Beta 4 had TUAW bring word on iController, an Apple project that would allow the iPhone to connect to shared iTunes libraries to browse and play media, similar to how the Apple TV functions. April 28, 2008: TUAW's tipster returns to reveal that the Beta 4 holds evidence of Jabber/XMPP protocols for instant messaging. Mobile iChat again moves from future potential to present possibility. May 5, 2008: MacRumors reported that Apple had quietly added Chinese "handwriting" support to 2.0. Not only the key to a massive Asian market, the idea of handwriting recognition itself was huge. Could non-ideographic language support follow? May 7, 2008: iPhone 2.0 Beta 5 landed with not much new, it seemed, but dev tools and tweaks. A TUAW tipster soon brought word of .Mac "push" Settings. The buzz of a .Mac ramp up continued, even if on the email-only side. Still, could this be an effort to deliver something akin to ActiveSync functionality to non-business users? May 8, 2008: Following up on their .Mac "push" email story, TUAW reported that the entire .Mac service would be revamped along with the iPhone 2.0 release at WWDC. Full wireless (wifi + cell) calendar, contacts, and email sync for both Mac and Windows (?!) users. May 12, 2008: Apple Insider brought word of developers discovering strings that indicated 3G data support. 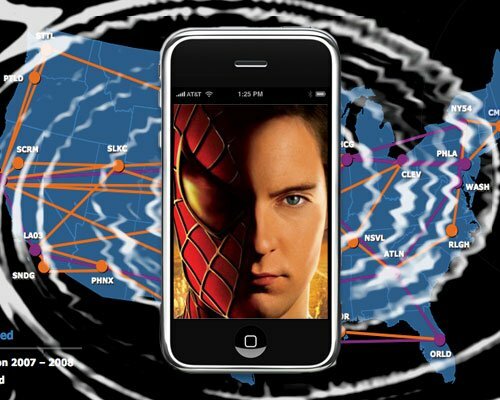 While some controversy surrounding fake/mocked-up screenshots distracted from the news, this was the first software confirmation of the much-anticipated iPhone 3G. May 22, 2008: Apple Insider again delivers the goodies, this time from "private" updates to "select developers" that showed support for Geo-Tagging. Although not necessarily bound to GPS (Google cell tower and SkyHook Wi-Fi triangulation are already on the iPhone), Geo-Tagging is typically used to add location-based data to photographs. May 28, 2008: Less than three months in, and Apple released iPhone 2.0 Beta 6! This could well be the final beta going in to WWDC. Any last minute surprises? May 30, 2008: Coding Robots went through OS X 10.5.3 and found that .Mac was .missing. Seems the name had been replaced with a string variable that would allow Apple to change it. Could the rumored revamp include brand new branding as well? At the same time, Apple Insider's patent watchers found a filing for a system to warn users of impending system loss, and another to help locate missing Blue Tooth enabled or tagged items. While iPhone users had been hankering for better BT support, stereo headset and keyboard-style peripherals were no doubt higher on the list... Could they, at least, be headed for 2.0? 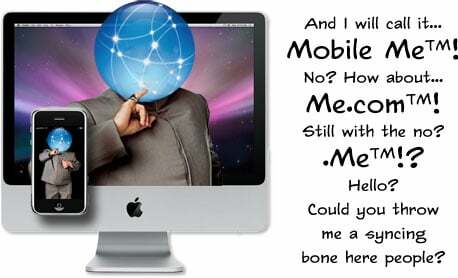 May 30, 2008:The missing .Mac mystery deepened as DaringFireball suggested an old Apple trademark may be the new online services marquee: Mobile Me. Howls of grief and confusion echoed through the interweb pipes for days. June 3, 2008: Those of us who use it found the .Mac email service down. Was Apple shuffling things behind the scenes in preparation for WWDC? Also from TUAW came word that, due to carrier "first look" agreements, the 2.0 firmware gold master from this week would require 1-2 weeks of testing before it could be released to the public, pushing it back as far as end of June/early July. June 4, 2008: A Gizmodo reader found icons for the iPhone (and iPod Touch) in a place typically reserved for Bonjour-capable devices. Apple's implementation of the zero config networking system, iPhone integration could allow for wireless syncing. 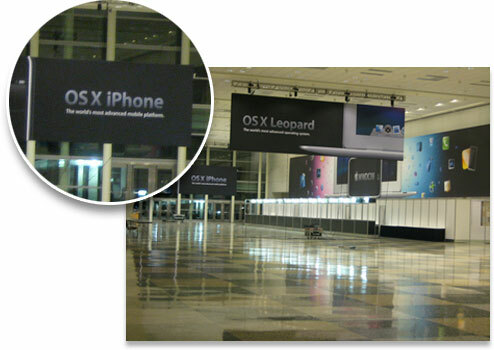 June 5, 2008: WWDC banners unfurl, highlight a branding change to iPhone OS X, the World's Most Advanced Mobile Platform. So there you go. We already know what Casey's top ten most wanted features are, now it's your turn. Tell us what surprises YOU think the iPhone 2.0 software and services bundle will have for us. Tasks? Consumer-oriented "push" mail/contacts/calendars? Even more Google or Yahoo integration? Custom Widgets? MMS? iChat 3D? Photo Speed Dialing? ... Cut and @#$% paste?! Go back and read Part 2: What’s the iPhone 3G Going to Look Like?